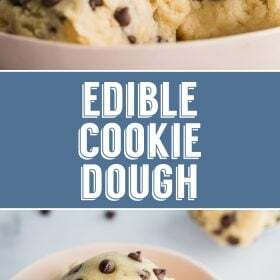 EASY Edible Cookie Dough Recipe- this cookie dough is eggless and completely edible! You can make it plain or with chocolate chips, m&ms or whatever you desire! SO GOOD! I’ve been dreaming of this recipe for a LONG time. 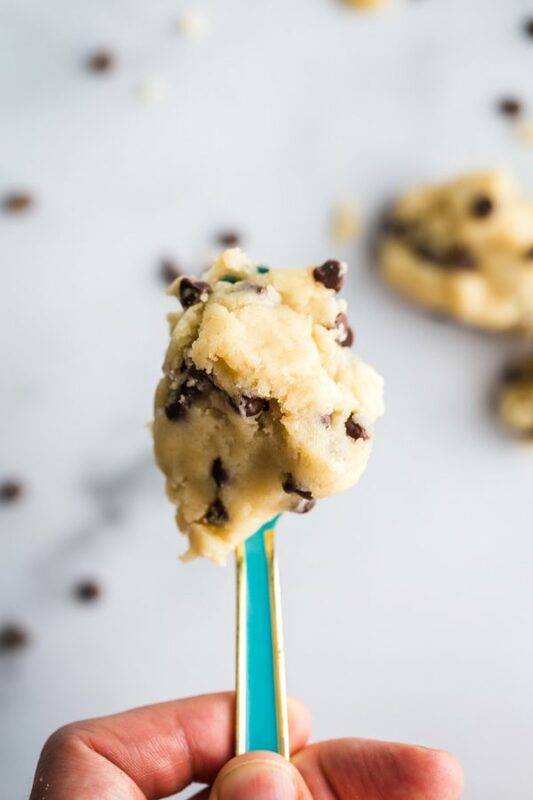 If there’s one thing that I like more than warm chocolate chip cookies, it’s eating the cookie dough. 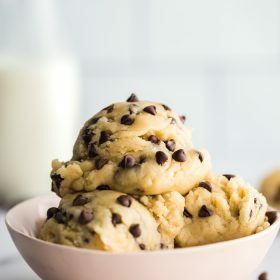 But since it’s unsafe to eat raw eggs and raw flour, I created a cookie dough recipe that has NEITHER of those 2 things. WIN WIN WIN! There’s a cookie dough shop here in Nashville that is close to one of our favorite parks. 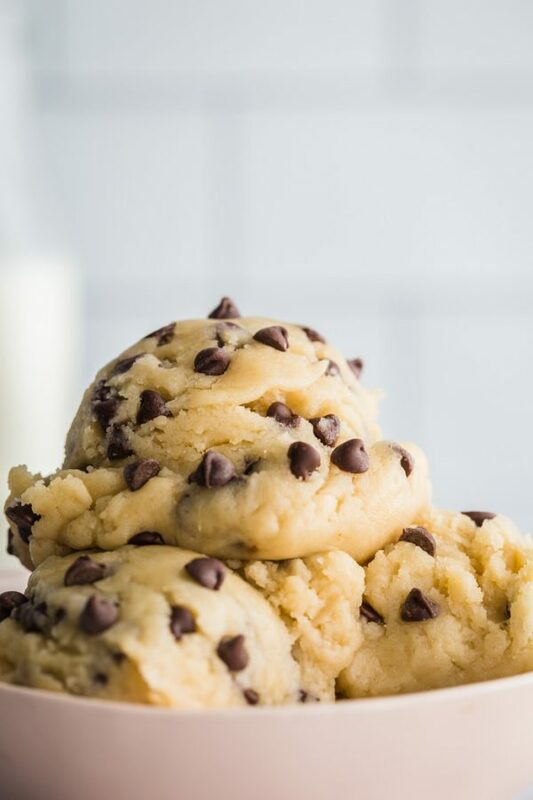 We go over there from occasion to get edible cookie dough and EVERY time, I keep saying that I need my own homemade recipe. 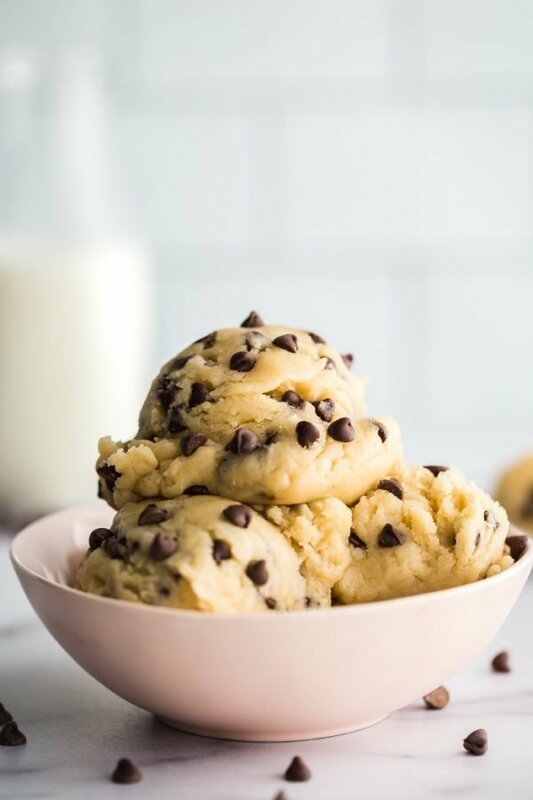 This one is EVEN BETTER than what I get at that little cookie dough shop and I’m excited for you to try it! To keep things simple, I used my favorite chocolate chip cookie recipe and simple adjusted it so that it was safe to eat. This meant leaving out the eggs and baking the flour for a few minutes so that it is safe to eat. 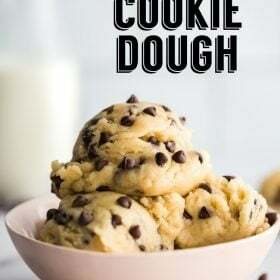 Since this is an eggless cookie dough recipe, I subbed in a little bit of milk (regular milk or a plant based milk will work just fine) so that the dough wasn’t too dry. Is raw flour safe to eat? Everyone knows that raw eggs aren’t safe to eat but many people, myself included up until recently, do not know that raw flour is not considered safe to eat either. To solve this problem, we’re simple going to bake the flour in the oven for about 5 minutes so that it’s cooked and safe to mix into our dough. EASY! This recipe is ridiculously easy to throw together! As stated above, we’ll first bake out flour. Then we’ll start the cookie dough by creaming together the butter and sugars. I just did this with a whisk instead of dirtying my standmixer but you can obviously do that as well. Then add in all of the remaining ingredients, waiting to stir in the chocolate chips at the end. If you happen to watch the video, I forgot to show putting the milk in but there is a little milk in this. 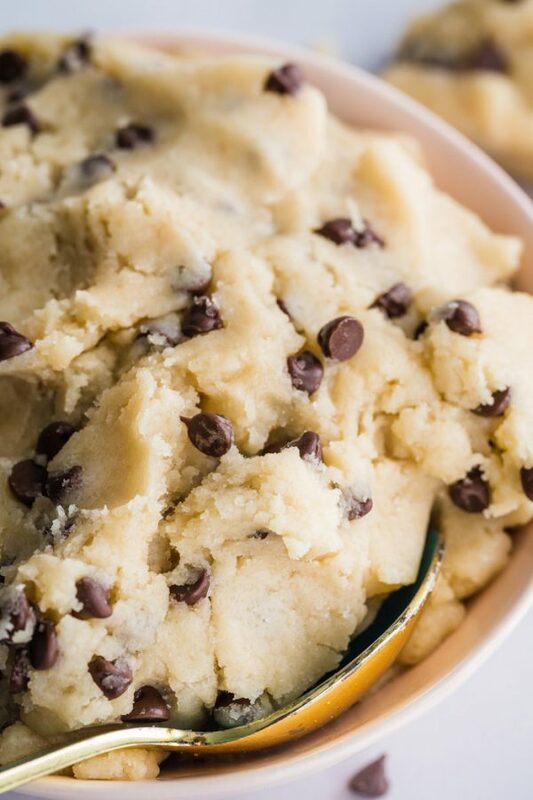 Is this edible cookie dough vegan? Since there are no eggs in this recipe, it’s very easy to adapt this to make it vegan. Simple use a vegan butter OR coconut oil in place of the butter and swap the milk for any plant based milk that you prefer. OH and make sure to use a dark chocolate or other dairy free chocolate chips. 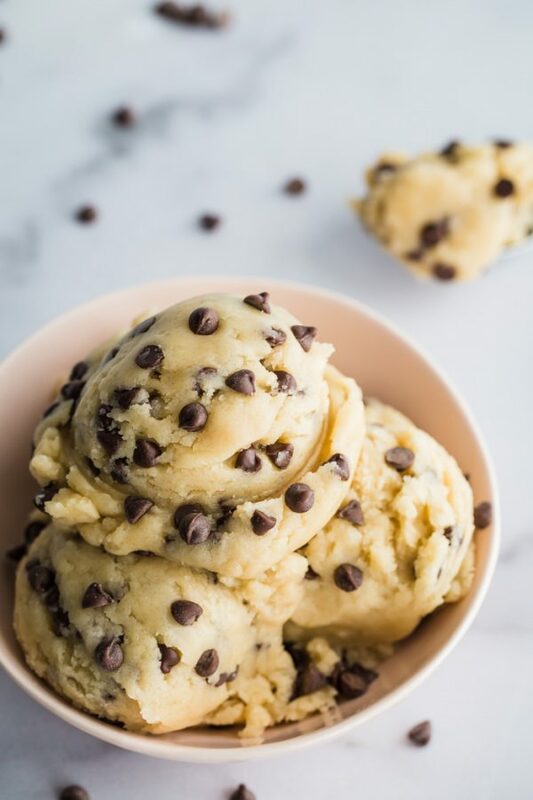 Easy vegan edible cookie dough! Pre-heat your oven to 350 degrees F. Spread the flour out in an even layer on a baking sheet and bake in the pre-heated oven for 5 minutes. Let cool. In a medium bowl, cream together the butter and sugars and fully combined. Add the vanilla, flour, salt, and milk and mix until fully combined. If it’s a little too dry, you can add in a splash more milk. I made the mistake of 1/2 cup too and was so confused as to why it was runny. I thought I used the wrong vegan butter. Then I saw this comment. I’d definitely try fixing the typo if you can so others don’t run into the same trouble. It’s delicious, BTW!